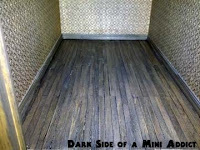 Nothing but flooring..in the pictures that is. Do you ever get that little voice in your head that says nope that’s not quite right? Well I did so this weekend I mixed brown & black paint with that stuff that turns acrylic paint into stain and with a paint brush and rag I went to town on the floors. 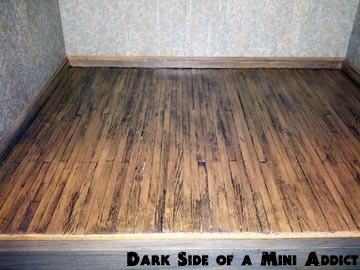 I’d glop some paint/stain on the floors and smush it around. I even made sure to get it on the base boards and in the corners. Then with the cloth I’d wipe it back down. I did this several times so it brought a more worn look to the floors. Between each layer I would let the floor dry; this was easier than I thought considering I have 4 rooms with wood floors. The floor looks great, nice colour variations. Lea Frisoni discusses lead/zinc roofing elements in her book, she uses cardstock painted in a appropriate darked silvery colour, it looks effective. Thanks for the heads up, I'll have to see if I can find a copy of the book. The floor looks so warm and cottage like. Great job! Your shingles will look just as great I'm sure. Thanks for entering my giveaway. Wow, look at that flooring!! I so admire miniaturists like you who can actually BUILD!! FAB!!! Thanks Kiva, It has pretty much become my place of peace! after a long hetic day or trying week I can just go cut, sand, glue, etc. and the week just melts away! Now if I could just make clothes for my mini people they would be really happy!